As the capital of Ireland, Dublin offers visitors an array of attractions, restaurants, and activities for visitors to choose from. With so many options to pick from, sometimes travelers can feel overwhelmed trying to decipher which they should visit. We have put together an itinerary of how we would spend a free day in Dublin. Trinity College: The Book of Kells is a must-see attraction for many visitors. Located in the heart of Dublin, the exhibition displays the Book of Kells, a 9th century manuscript that documents the four Gospels of the life of Jesus Christ. The Exhibition also features access to the Long Room, one of the world’s most beautiful libraries, which houses 200,000 of Trinity College’s oldest books. While on campus, visitors can also partake in a campus tour – guided by a current Trinity College student. During the tour, you will be able to roam the campus grounds and learn the history behind this popular university. Pro Tip: Purchase your tickets in advance to gain “skip the line” entry and avoid long queue lines. Grafton Street: Grafton Street is a main shopping street in Dublin, lined with boutiques containing the creations of Ireland’s trendy designers. Stephen’s Green: The park provides an oasis of green calm in the middle of a bustling city. Its four centuries of history are eventful and complex, involving such important figures as Arthur Guinness, 1st Baron Ardilaun, and Countess Constance Markievicz. Visitors can view many historic sculptures, birds, and plants within the park. St. Patrick’s: Since Saint Patrick baptized Christian converts nearby over 1500 years ago, this holy site has been a place of spiritual encounter for countless generations. Visit to experience the history, the church’s place in the life of the city, and their tradition of worship. Dublin Castle: Built in the early thirteenth century on the site of a Viking settlement, Dublin Castle served for centuries as the headquarters of English, and later British, administration in Ireland. In 1922, following Ireland’s independence, Dublin Castle was handed over to the new Irish government. It is now a major government complex and a key tourist attraction. Guinness Storehouse: A former fermentation plant at the St. James’s Gate Brewery is transformed into a seven-story interactive experience bringing the story of world-famous stout to life. The Guinness Storehouse opens its doors to the public and becomes the official home of Guinness in the historic heart of Dublin. Dinner in Temple Bar area: Temple bar is located on the Southbank of the River Liffey. It is one of the oldest areas in Dublin and is home to one of Europe’s oldest built theaters (Smock Alley Theater). Over the years it has maintained its medieval street exterior with narrow cobbled streets. It is famed as being the cultural quarter of Dublin with a number of cultural organizations, artists, and creative professionals based in the area. It is well known for its lively nightlife and attracts a number of tourists with its large variety of bars, clubs, and restaurants. 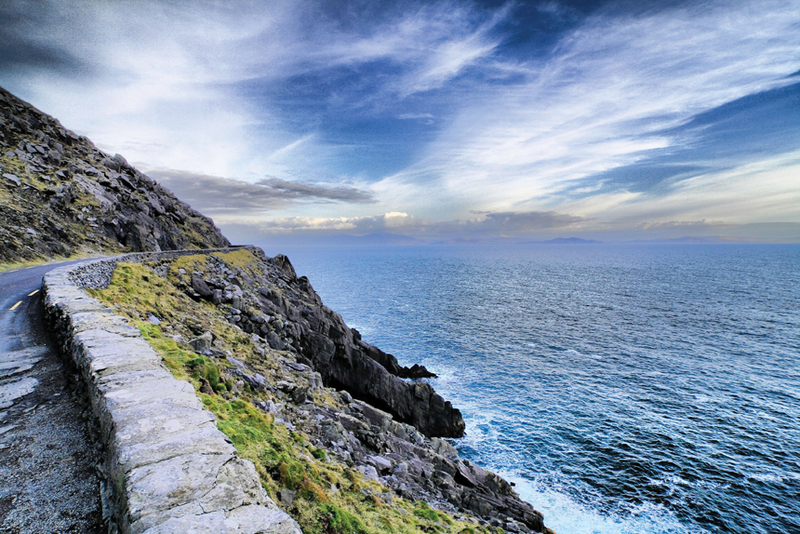 The Ring of Kerry is one of Ireland’s most scenic touring options. Travelers from all over the world flock to see the views that this picturesque area, hidden in the southwest corner of Ireland, has to offer. Visitors are able to discover the authentic wilderness of Ireland while touring this stunning area, as they bypass the white sandy beaches, rugged coastlines, and dramatic mountain scenery. Begin your journey in the charming town of Killarney, a vibrant town comprised of history, heritage, and lively festivals. Many travelers are drawn in by the friendly atmosphere of this charming little town. While in the area be sure to grab a bite to eat at one of the many great seafood restaurants within the area and enjoy some of the top attractions Killarney has to offer, such as the Muckross House, Killarney National Park, or Dunloe Castle. Nestled within the 26,000 acres of Killarney National Park is the Muckross House, a 19th century Victorian Mansion. Standing along the shores of Muckross Lake, the elegant Victorian house, surrounded by the world-famous Lakes of Killarney, mountains, and woodlands, creates impressive views for guests who are exploring the area. The unique and distinctive combination of mountains, lakes, woods, and waterfalls, gives the Killarney National Park a special scenic beauty. With ample wildlife and an abundance of greenery, Killarney National Park offers a tranquil, scenic, setting for those looking to take a stroll, go kayaking, or partake in a traditional jaunting car ride. 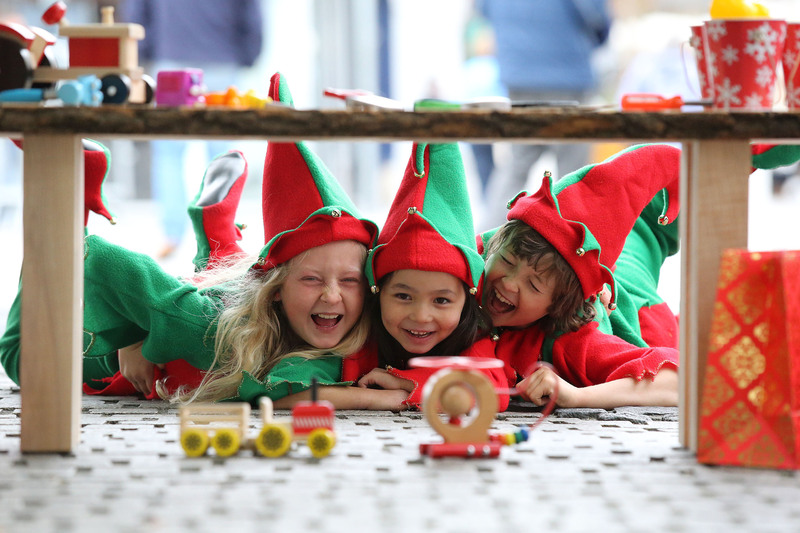 From Killarney, you will continue on to Killorglin, famous for its traditional Puck Fair, Ireland’s oldest festival dating back to the 17th century. This town offers an enjoyable melting pot of pubs, cafes, and galleries to their visitors. Continue your drive along the coastline of the broad Iveragh Peninsula, through the towns of Glenbeigh, Cahirciveen, Waterville, and Sneem. Glenbeigh often referred to as “The Jewel in the Ring of Kerry”, offers six miles of golden, sandy, stunning, beaches. Visitors can escape from the stresses of everyday life and connect with nature with activities such as birdwatching, walking, horseback riding, or simply relaxing on Rossbeigh Beach. Cahersiveen is a quaint town in County Kerry that offers travelers unspoiled landscape, breathtaking beaches, and green forests. While in Cahersiveen, guests can visit the ruins of Ballycarbery Castle, once home to the McCarthy Clan, which dates back to the 15th Century. Waterville is a small coastal village located between the Atlantic Ocean and Lough Currane on the famous Ring of Kerry and Wild Atlantic Way routes. Many tourists flock to this scenic coastal town to partake in one of Waterville’s most popular activities, golf. Waterville Golf Links is regularly listed in the top destinations for golfers. Surrounded by sea, challenged and shaped by the elements, this course will require all of the shots you can muster to conquer it. Sneem, a village associated with a remote and relaxed way of living, is nestled between mountains and wild and rugged coast it offers some of the best views in the Emerald Isle. Visitors can unwind and connect with nature by observing the stunning landscapes, the abundance of wildlife, and the remoteness that Sneem has to offer. To complete this famous touring path, simply circle back to Killarney, your starting location. Like stepping back in time, World Heritage Sites are a portal into the real lives of ancient people. While traveling, go beyond tourist hot spots and discover the cultural riches of an area through its art, architecture, and ancient sites. Not surprisingly, Italy is home to the greatest number of World Heritage Sites in the world, with over 45 UNESCO World Heritage Sites. Of course, everyone knows Venice, Rome, Florence, Naples, and Siena. But, among others, Italy is also home to the unique region of Cinque Terre. Cinque Terre is a string of centuries-old seaside villages of coral, sage, and egg-plant colored buildings, cliffs mirrored on the Tyrrhenian Sea, vineyards planted on perilously steep slopes, and breaking waves scattering a fine mist over. Cinque Terre reflects the harmonious interaction between man and nature to produce a landscape of exceptional quality that moves the heart like few places in the world. The region of Cinque Terre is composed of five main villages including Monterosso al Mare, Vernazza, Corniglia, Manarola, and Riomaggiore. Monterosso is the biggest and the oldest of Cinque Terre’s villages, dominated by the ruins of the castle and characterized by typical narrow, medieval streets, with multi-colored terraced houses, and lined with an extensive sand beach. While in Monterosso, you can fill your time by visiting some of the city’s historical buildings and statues such as the Church of St. John, the “Giant Statue”, Aurora Tower, or Sanctuary Soviore. If you are visiting during the summer months, you can also enjoy the sun and take a dip in the water at Cinque Terre’s best beach. Afterward, enjoy the lively nightlife with some of the ample activities offered within the area. Vernazza is perhaps the most beautiful and steepest villages of Cinque Terre. Visitors can stroll the scenic waterfront, snap photos of the charming pastel-colored buildings, and explore a medieval castle before heading down to the sandy beach for a refreshing swim in the sea. Corniglia is the highest and smallest of the Cinque Terre villages. Visitors can step back into time by visiting some of the area’s religious attractions such as the Church of St. Peter, the Chapel of Saint Catherine, and the Sanctuary of Our Lady of Graces. Those who are looking for a more laid back, local feel, will love the quietness that Corniglia offers. Wine enthusiasts will love Manarola, as grapevines flourish in this Cinque Terre village. The village is known for its Sciacchetrà, a sweet wine typically paired with desserts or cheese. Not only can visitors discover the beautiful vineyards of Manarola, however, they can also view the rocky harbors and historical monuments that the village has to offer. Riomaggiore is the largest of the five Cinque Terre villages and offers stunning views of pastel buildings, a steep ravine, and a tiny harbor. The beautiful town of Riomaggiore rises in between two almost broken hills that slope right into the water. There was once a river that ran through the valley which was “Riomaggiore,” hence the name. The place is very famous to start a trek but has its roots in history with some places of must visit. 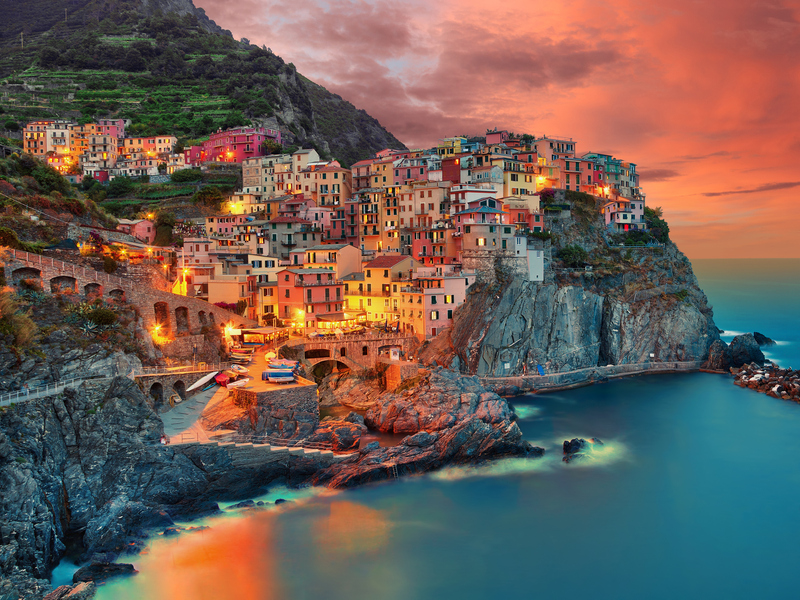 Regardless of which villages you decide to visit while in Cinque Terre, you are sure to discover the ample beauty of this unique area from the colorful buildings, scenic cliffs & harbors, and ample vineyards the region has to offer. Like many, when I first started planning my trip to Europe, I was imagining all of the cute outfits I would pack, pinning every European Fashion Board that I could find on Pinterest. We were traveling to Switzerland & France, two areas which are known to be fashionable, and I did not want to stick out as a tourist. As I began shoving every item from my closet into my over-sized suitcase, I quickly began to realize that all of my items simply were not going to fit. Bearing this in mind, naturally, I began stowing my items in my husband’s suitcase, hoping that he somehow would not notice the items I had casually slipped in there. Once we arrived in Switzerland, I immediately began to regret my packing decisions. After taking a bus, a train, and walking for a decent amount of time, we finally made it to our hotel. Not only was lugging all of our items daunting, but we also managed to break a wheel off of a suitcase in the process, making it that much harder to navigate around Geneva. I immediately realized that when packing for Europe, less is more. Not only from a navigation standpoint, but some European hotels often do not have elevators, or large areas to stow luggage in your room, like we are used to in the U.S. Not only had I begun realizing that I had packed a little too much, but I also realized that I hadn’t quite packed the right things. Adapters: While I had known that I had to bring an adapter to charge my phone in Europe, I had failed to realize that different countries may utilize different outlets. Apparently, we had packed an adapter for France but had failed to realize that we needed a different adapter for Switzerland. After buying two adapters, we finally realized our mistake and bought the correct adapter – third time’s the charm, right? Beauty & Health Products: In an effort to save some space in my suitcase, I had planned to purchase any small beauty items I may need in Switzerland. I would highly recommend packing any beauty/health items you may need, as the prices in Switzerland are considerably higher than that in the U.S. Bearing this in mind, I would double check that you packed everything on your list, just to ensure there is nothing you forgot! In regards to hair appliances, as with adapters, I would recommend researching to see if the items you are packing will work where you are visiting. Some U.S. appliances, such as hair dryers or straighteners, have a higher voltage then used overseas, requiring a converter for usage in other countries. 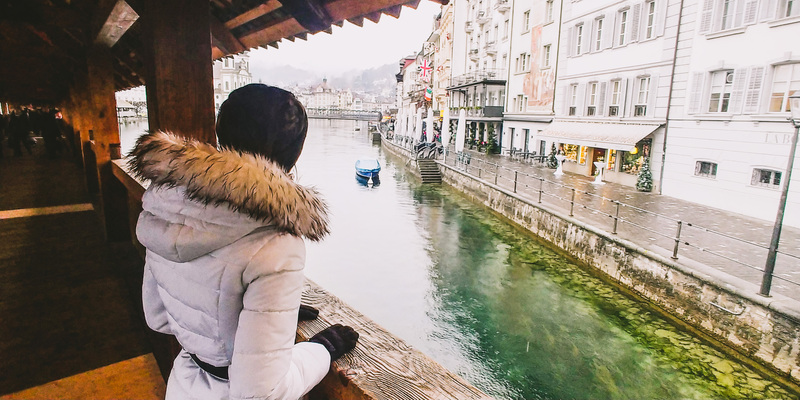 Clothing: Regardless of what time of year it may be, or what country you are visiting, I have learned that it is always a good idea to pack some rain gear when traveling to Europe. Even though we had visited during the winter months, we still got caught in the rain during our trip. A hat, umbrella, or rain jacket is never a bad idea! Currency: My husband and I had decided to not take out any local currency, as the currency differs from Switzerland (Francs) and France (Euros). I would definitely recommend a small amount of local currency, just to be prepared. While all of the stores & restaurants we had visited had taken credit cards, we ran into some instances in wish we had some physical money. In some areas throughout Europe, it is common for you to pay to utilize public bathrooms. While we were able to find some that were free to use, having a few Francs or Euros on hand, would have been a bit of a time saver. Bearing this in mind, while packing for your first European vacation remember – less is more, and you will be all set. Discover the breathtaking landscapes and dramatic scenery of Scotland by foot, allowing you to truly immerse yourself in the surrounding beauty. With rugged coastlines, tranquil forests, and breathtaking mountains, the scenery of Scotland is truly unmatched. Scotland offers a variety of hikes and walks, catering to people of all abilities. 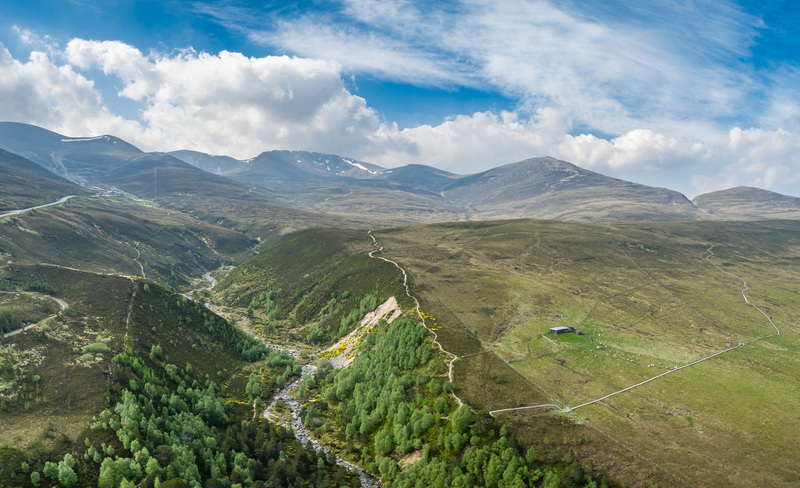 The Cairngorm National Park, in the heart of the Scottish Highlands, has everything from castles to distilleries, providing plenty of attractions and endless fun. As UK’s largest National Park, visitors are provided with ample options for activities when visiting, whether you are looking to explore mountains, water, or greens, there are plenty of activities that suit all visitors. If you choose to stay at the park during the evening, you will be able to discover the natural nighttime beauty of Scotland with stargazing. As the most northernly Dark Sky Park in the world, the dark skies provide clear visibility and endless opportunities for stargazers. The Abernethy Forest and Ryvoan Circuit provides paths of magnificent pinewoods, taking visitors through the heart of the largest area of Natural forest in the U.K. Walking through the Abernethy Natural Reserve provides guests with sights of rich and varied landscapes shaped by underlying rocks, soils, and landforms. Strathpeffer is an excellent walk through forestry and then along a distinctive ridge with extensive views. This walk follows paths across the hills overlooking Strathpeffer before climbing to the ridge, where you are rewarded with wonderful views. The summit is a wide, grassy square fringed by some strange looking rocks. These are in fact the remains of an extensive iron-age fortress. A walk to Sandwood Bay provides one of the best hikes in Scotland as it takes you to one of its best beaches. A 14km walk (round trip) takes you to a beautiful sandy beach where you can watch the huge waves crash in. View wildlife and spectacular scenery as you hike towards the beach, being rewarded when the fabulous views of Sandwood Bay come into view, perhaps the most beautiful beach in Britain. Spend time exploring the mile of golden sand and dunes, with rocky cliffs and a giant sea stack to complete the scene. As the holidays quickly approach, people from all over the world are preparing to celebrate Christmas. We are taking a look at the different traditions from around the world which make celebrating this special day so unique. Ireland: In Ireland, the Christmas décor, including Ireland’s Christmas Markets, comes in full swing December 8th, and celebrations last until January 6th. To celebrate the holiday, the Irish are known to hang up mistletoe in their houses, as the ancient Celts had believed that mistletoe had secret healing powers. More recently, the people of Ireland have also begun to add a Christmas tree to their list of holiday décor. Other ways to celebrate Christmas in Ireland include making “The Winter Warmer”, a hot whiskey to stay warm during the colder months, participating in a “Christmas swim”, and lighting candles in your windows during Christmas Eve. Italy: Like Ireland, Italy begins their Christmas celebrations on December 8th and continues the festivities until January 6th. If visiting Italy during the holidays, you will find bagpipe playing shepherds performing tunes in piazzas, normally dressed in traditional sheepskin and wool cloaks. In Rome, crowds will gather in St. Peter’s Square for the pope’s evening mass on Christmas Eve. He will then appear at the basilica’s balcony on Christmas to give his blessing. At midnight on Christmas Eve, you will be sure to hear the ringing of church bells and if staying in Rome, you will also hear the cannons being fired from Castel Sant’Angelo, in celebration of Jesus’ birth. Scotland: Christmas is a holiday that was once banned in Scotland, from 1640 – 1958 due to religious conflict, which means that Scottish Christmas traditions are relatively new. Some of these newfound traditions include the baking of Yule bread, a delicious treat made with caraway seeds which resembles a rope arranged into a circle. Other Scottish traditions are superstitious, many of which revolve around fire. The most famous practice is the burning of the Cailleach, also known as the Hag of Winter who brought the cold and darkness, in hopes of banishing cold, darkness, and hardships in the future. Wherever you decide to celebrate the holiday season, we wish you a time of happiness, prosperity, and good health. Buon Natale. Nollaig Shona Duit. Ablythe Yuletide. Merry Christmas. St. Patrick’s Cathedral: As the largest cathedral and one of the most important pilgrimage sites in Ireland, Saint Patrick’s has been at the heart of Dublin and Ireland’s history and culture for over 800 years. Since Saint Patrick baptized Christian converts nearby over 1500 years ago, this holy site has been a place of spiritual encounter for countless generations. Visit and experience our history, our place in the life of the city, and our tradition of worship. Guinness Storehouse: Located in the heart of the St. James's Gate Brewery, the Guinness Storehouse® is Ireland's most popular tourist attraction. It's the home of the Black Stuff, the heart of Dublin and an unforgettable start to your Irish adventure. The journey begins at the bottom of the world's largest pint glass and continues up through seven floors filled with interactive experiences that fuse our long brewing heritage with Ireland's rich history. At the top, you'll be rewarded with a pint of perfection in our world-famous rooftop Gravity Bar. St. Stephen’s Green: If you find yourself needing a break from the fast-paced atmosphere of a city, venture over to St. Stephen’s green, a public park in Dublin, with a Victorian layout. St. Stephen’s Green is a great place to mix with the locals and rest your legs. Ha’penny Bridge: Venture over the Ha’penny Bridge, famously known as the first pedestrian bridge to cross the Liffey. While this bridge is known by several names, the name “Ha’penny Bridge” refers to the toll that pedestrians used to pay (a halfpenny) in order to cross. EPIC Museum: EPIC tells the moving and unforgettable stories of those who left the island of Ireland, and how they influenced and shaped the world. 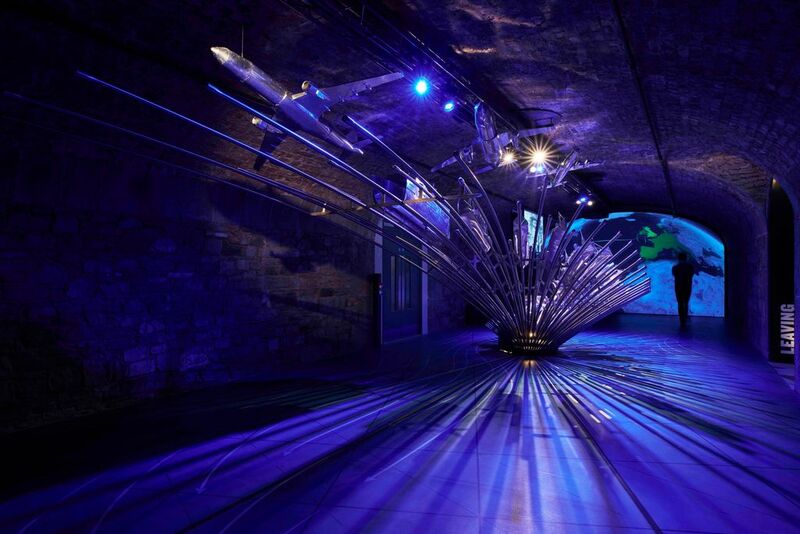 EPIC embraces the past and the future with 1,500 years of Irish history and culture housed in its atmospheric vaults. Watch characters from the past tell one-of-a-kind tales of adventure and perseverance, conflict and discovery, belief and community. Trinity College and the Book of Kells: Trinity College was created in 1592 by a royal charter, at a time when universities were being established throughout Western Europe. The 690-page Book of Kells is the centerpiece of the “Turning Darkness into Light” exhibition which attracts over 500,000 visitors to Trinity College every year. Written around 800 AD, the Book of Kells contains a richly decorated copy of the four gospels in a Latin text, written on vellum (prepared calfskin). The script is embellished by the elaboration of keywords and phrases and by an endlessly inventive range of decorated initials and interlinear drawings. 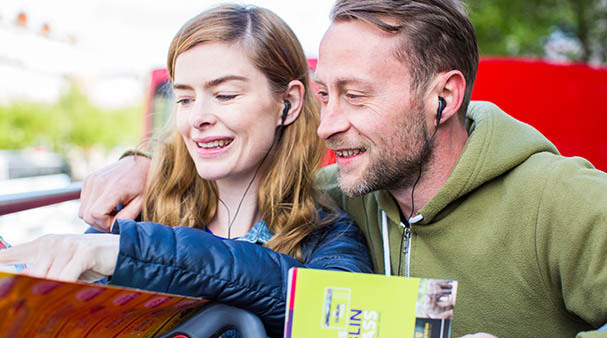 Did you know that Celtic Tours partners with the Leisure Pass Group to bring you top attractions and hop on hop off bus tours in cities such as Dublin, London, and Rome! Dublin Pass: The Dublin Pass is a sightseeing city card which allows visitors to experience everything Dublin has to offer while saving both time & money. The Dublin Pass includes free entry to over 30 top attractions, monuments, and museums, as well as a wide range of additional discounts and dining offers. 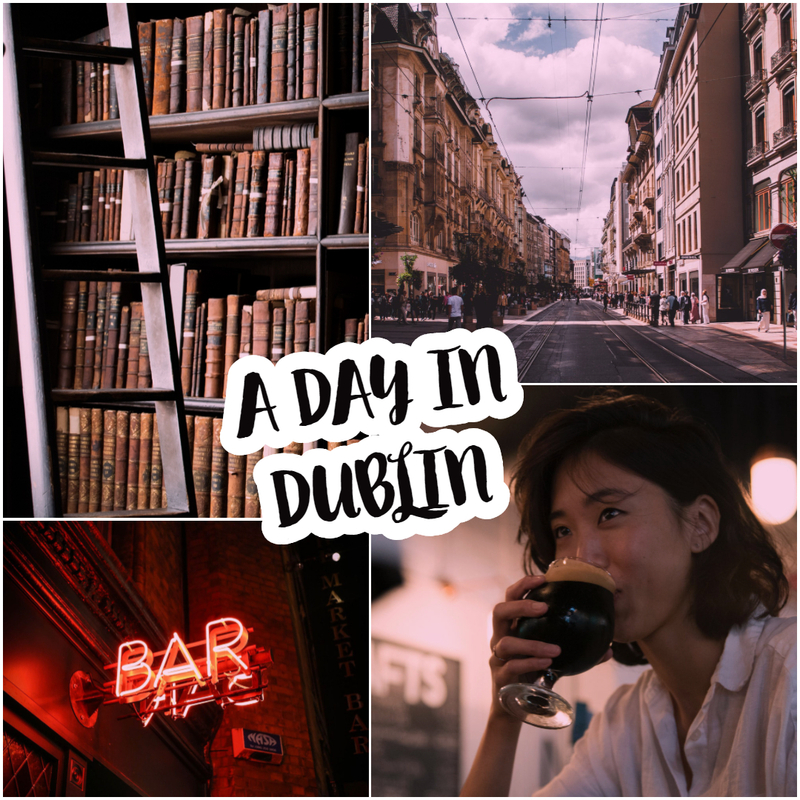 Entry to over 30 of Dublin’s most popular attractions, sights, and landmarks – such as Guinness Storehouse, Teelings Whisky, St. Patrick’s Cathedral, EPIC Ireland, Irish Rock ‘n Roll Museum, Jameson Distillery, & more! Guidebook to help plan your sightseeing adventure and guide you around the city! London Pass: The London Pass is the ultimate sightseeing package that has been tailor-made for those looking to explore the city. The London Pass gives holders the ability to make the most out of their trip, with visits to top sights and attractions; saving both time and money. Entry to over 80 attractions, tours, and museums, including Tower of London, Westminster Abbey, and more! Rome Pass – Omnia Multi-Pass: The Omnia Vatican & Rome card is a sightseeing package which gives holders free entry to top attractions in the city, and allows you to make the most out of your time, with skip the line access for some of Rome’s top attractions! The Leisure Pass is an affordable option which allows you to add value to your next city stay in Dublin, London, or Rome. Contact your local travel agent to book your Leisure Pass today! Technology can help alleviate some of the frustrations that people tend to experience while traveling. This blog covers a few ways that you can use technology to avoid a stressful situation. Email yourself a scan of your passport: Scanning a copy of your passport will provide you with key information such as your passport number, issue date, and expiration date in case your passport has been lost or stolen. Use Google Maps offline: Google Maps can get you out of a jam if you’re lost or trying to find a place, but it doesn’t help you if you’re traveling out of country and trying to avoid roaming charges from your cellular provider. The fix is to save Google Maps directions offline so you can access the info without using data. Here’s how to do it. (Hint: do this before you go offline). On your phone or tablet, open the Google Maps app. Search for a place, like Palm Springs, Madrid, you get the idea. At the bottom of the page, tap the name or address of the place (in the white bar). If you search for a “place” like a restaurant, tap More. Check your flight’s entertainment options before boarding, and make sure you have any necessary apps: Make sure that you check your flight’s entertainment options prior to boarding, so you can download any apps necessary to have in-flight entertainment. Store power cords in a small case – such as an old sunglasses case: Storing cords in one place, such as an old sunglasses case, will help alleviate the stress of trying to find them mid-flight! Bring a converter: European countries use different outlets then what we have in the U.S. Make sure to have the correct adapter with you when traveling, so you are able to charge your phone. Going to multiple countries? Not every country in Europe requires the same converter, so ensure that you are prepared for each country you will be visiting. October is a time full of fun festivities, delicious treats, and scary stories as we gear up to celebrate Halloween. Did you know that this frighteningly fun holiday originated in Ireland? Halloween originated with the ancient Celtic festival of Samhain, where people lit bonfires and wore costumes to ward off ghosts. Halloween has since evolved with fun festivities and games. 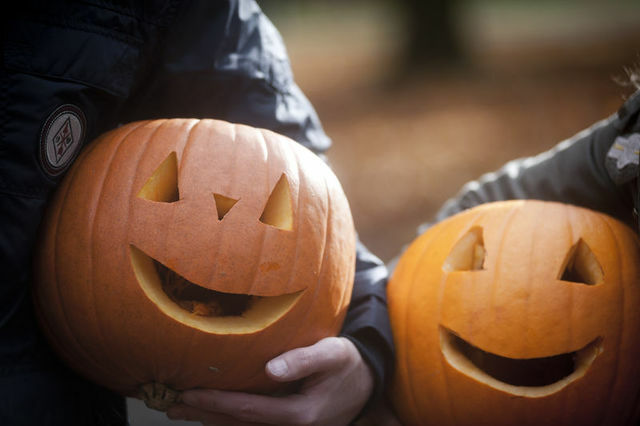 Even though this holiday is celebrated by many, Ireland is home to some of the biggest Halloween festivities in the world. Derry, voted the "Best Halloween Destination in the World" in 2015, earned its title through their expansive offering of festivities including; fireworks, musical performances, haunted trails and more. Learn of the haunted tales of the walled city, which is said to have ghosts roaming throughout. One haunting tale includes the story of the White Horse Hotel, which is rumored to be haunted by a mail stagecoach and ghostly driver. Legends say that these ghosts pull up to the hotel, only to mysteriously disappear. Another area within Derry which has been said to be haunted includes London Street, a popular area for pubs, stores, and ghosts. There have been several reports of strange noises, ghost sightings, and unexplainable occurrences. These are just a few of the many ghostly sightings within Derry. If you are looking for a place to enjoy some good drinks, food, and history, perhaps visit Grace Neills, which is said to be the most haunted pub in Ireland. Grace Neills was established in 1611, making it one of the oldest pubs in Donaghadee. Over time this establishment has been visited by smugglers, pirates, sailors, and of course ghosts! Members of staff have reported mysterious occurrences of glass and books moving around on their own, lights randomly flickering on and off, and slow footsteps being heard from above. While these random occurrences are sure to leave any customer feeling spooked, there have also been ghost sightings within and around the pub. There have been reported sightings of a Victorian lady lurking about in the darker recesses of the premises, and people have claimed to have felt an invisible presence pass through them, in the vicinity of the pub's staircase. It's no surprise that this jail is one of the most haunted places within Dublin. Reports of ghostly activity have been recorded since the 1960s. Flickering lights, the sound of mysterious footsteps, and workers being knocked over by random gusts of wind, are some of the many stories told by workers. Interested in checking out the supposedly haunted site yourself? You are able to visit the Gaol today, but keep in mind, strange things tend to happen here.